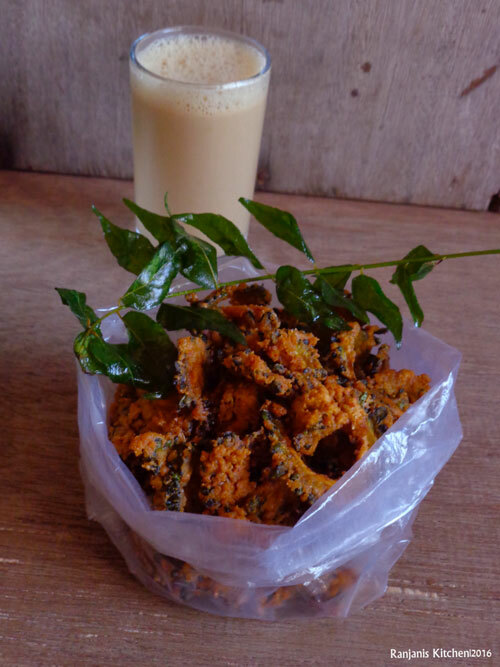 Pavakkai chips / Bitter gourd chips – sounds bitter isn’t it?? But the right way of preparation transforms the bitterness into the delicacy. Though I am not a big fan of pavakkai. When I see this recipe in sharmis place, the word a2b style tempted me to try out. 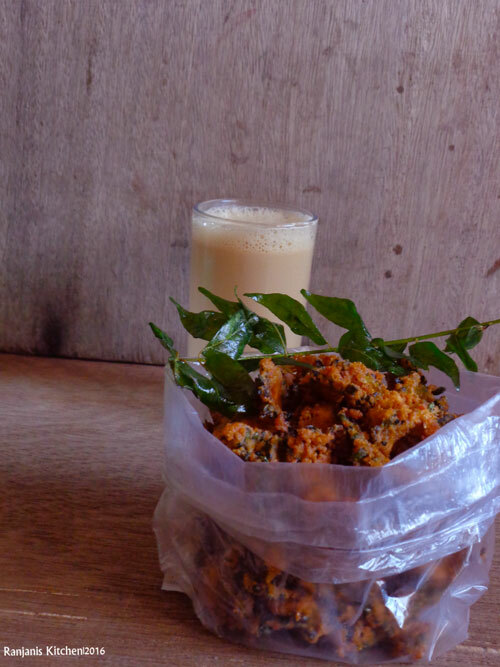 Trust me , it gives a perfect crispiness and tastes similar like ananda bavan and it is not bitter more. 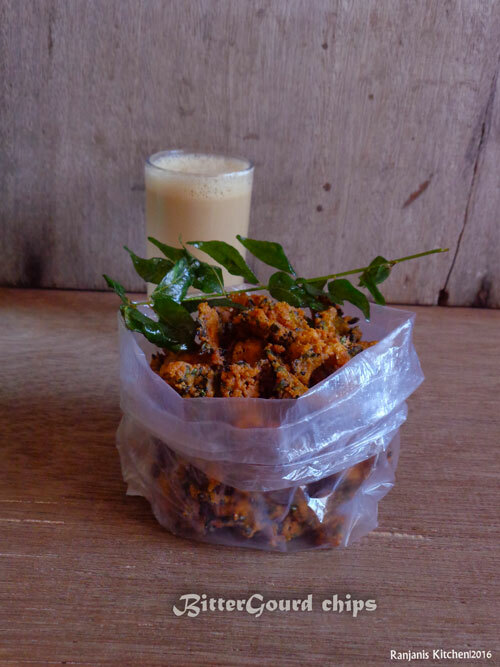 I would say it’s a perfect healthy snack to go with a cup of chai or coffee. Wash bitter gourd, trim the ends, de-seed and chop as thin equal sized slices. Sprinkle a tbsp. of water and blend well. Let it sit for 10 mins. Heat oil in a kadai, once heated, keep the flame medium and start frying pavakkai as small batches. Fry both sides equally to a golden brown, drain excess oil and place on a kitchen towel. 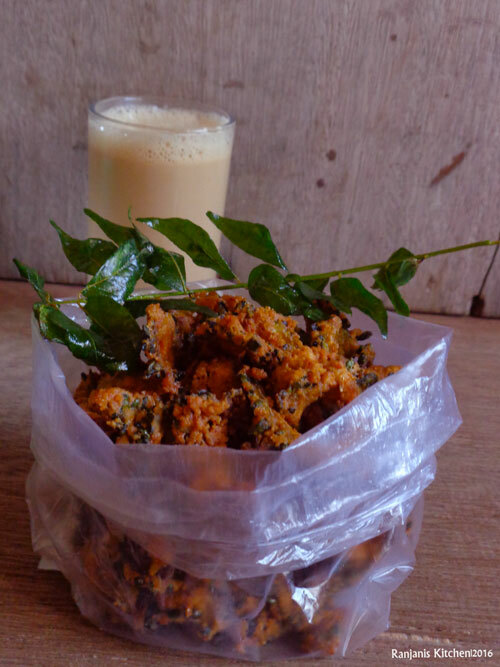 Serve hot with coffee or chai. The above-mentioned level of ingredients is for two bitter gourds. Adjust to the numbers you are using. You can get crispy fried chips in oil itself. If you are doing big batches and want to store for a long time, after fried in oil, spread in baking tray and bake for 5 mins in preheated oven. Adjust salt as of your taste. Remove the seeds in the centre and chop equal sized slices for the best result.